Alrighty, boys and girls! Are you looking to put in your writing into comic books? If you are, here's a little heads up: When you're writing for comics and graphic novels, you'll be appointed with established characters at one point or another. Clearly, anybody will tell you about a comic book writer who's worked on your favorites. *Comic book master Peter David states that when working with characters like Zatanna or the X-Men, you're being handed a certain degree of reader investment and it's easier to sustain and build an audience with established characters than ones made from scratch. Here's a couple of examples: *In Incredible Hulk #373, Peter David put a unique spin on Doc Samson. The Mother Superior berates an army colonel because he had gone to Catholic school. Samson showed no fear whatsoever because he's Jewish. 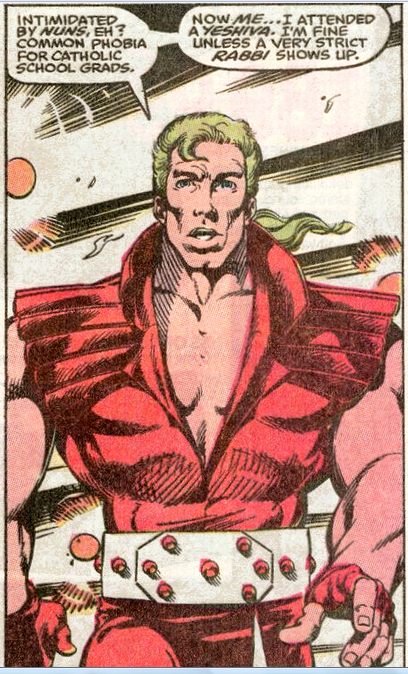 As a result, Doc Samson was the first Jewish character in the Marvel Universe. According to David, "Leonard" is a Jewish sounding first name and "Samson" is an Old-Testament hero. Another example of the topic is Judd Winick's run on Green Arrow in 2004. **In issue 43, Oliver Queen's ward, Mia Dearden was tested positive for HIV as a result of her previous life as a young prostitute. Despite this she's proven to be a capable fighter and archer which earned her the right to be the new Speedy and go off fighting alongside the Emerald Archer. The one thing to keep in mind sending established characters in bold and different directions is that you're the caretaker of these characters. *Now you can too with the following steps. Look for patterns. Pick a character and look for common threads and try to interweave them in ways other writers haven't. Pull on a single thread. All you need is just one thread. Following example of that is Kevin Smith's run on Daredevil. The "Guardian Devil" epic redefined the Man without Fear as DD faced a crisis unlike any he's ever encountered. The biggest moment of that storyline was the death of Karen Page. Get inside the character's head. Put yourself in the character's shoes and try to preceive things differently. Write dialogues that explore the innermost workings of his mind and break new ground. Creating your own superheroes can be fun, friends. But the greatest challenge is working with superheroes that've been around for a long time. As Mr. David puts it: "You're redecorating the living room, not demolishing the house." Gee . . . Karen Page died? How disappointing. (Which shows you how long it's been since I followed Daredevil. I agree; I've always thought of it as a particularly good test of a writer's quality to be able to carry on existing characters without either (a) simply repeating what's gone before or (b) wrecking the existing characters or backstories. Unfortunately, a series that goes on long enough is likely to experience enough of (b) to generate a pretty gnarly Continuity Snarl . . .
Wow. So that's the downside of it all. Oh yeah, Rick. The poor girl died in that one. For more check out the whole story. When I read that part of David's book I was amused and fascinated when he brought up the phone conversation with an assistant editor. The most biggest notion that painted me a picture was Alan Moore's run on Swamp Thing which changed the character completely. Instead of once being a human being turned into a thing of the swamp, he was a walking, talking thing of the swamp that thought it was human and went loco over the loss of his humanity. That comes from reading Volume one of Saga of the Swamp Thing. Not that there isn't horrible fanfic. 99% of everything is crud, including fanfic. But the good fanfic out there does what a professional writer in a shared universe (like DC's or Marvel's) would do- test old characters in new situations. Or, sometimes, reinvent the characters, as Moore did in Swamp Thing (and League of Extraordinary Gentlemen, and Lost Girls, and, to some extent, in From Hell). This is more controversial, but it can work. Moore's Swamp Thing seems well regarded by most.